Photo courtesy of Emily Maye. Tell me about your background as a photographer. 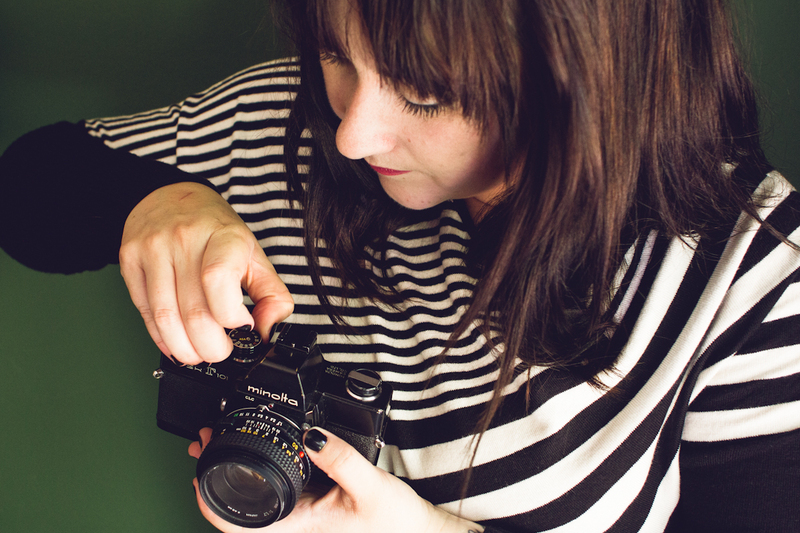 Do you have formal training/schooling in photography? I first took a photography class in high school and I really enjoyed that, but what I most enjoyed were movies and I decided to study cinema in college. I was in critical studies and then moved to screenwriting. After college I started experimenting with photography again and became more and more attracted to it as a storytelling medium, which I suppose, has been the attraction of both photography and film for me. I constantly feel challenged by how to tell a good story through pictures. Formally, I learned a lot through experimentation. The technical aspects of photography are interesting and fun to push to their boundaries but nothing can teach you how to use your eye quite like getting out there and doing it. I have a bike and I really enjoy riding it. I wouldn’t call myself a cyclist in a manner other than that. Riding a bike is a really wonderful thing, however that has little relationship to how I photograph the sport of cycling. I became interested in cycling as my subject matter after watching the Tour de France and learning about the history of the sport. After that I watched every race possible. I really love the sport and all its complexities. That tremendous affection I have for it certainly influences how I photograph it. Tom Boonen after Paris-Roubaix. Photo courtesy of Emily Maye. You’ve been involved in ballet your whole life and continue to photograph ballet and cycling, two subjects you say are “connected by common themes and tight clothing.” What parallels do you draw between cycling and ballet? How is that reflected in your photography? I grew up in ballet and still am involved in training young dancers when I am not photographing. I find a lot of similarities between the two and certainly the physicality of the athletes shows some similarity. There is an elegance to cyclists as well. At least in the way I see it. I really like the preparation in both, meticulous repetition and moving up through the ranks in a similar company structure. I was always attracted to the behind the scenes moments in ballet, waiting in the wings, exhausted after a tremendous physical exertion or the relationship between dancers that really become a family for one another. Those are the same things I am interested in with cycling. When you are standing at the start line for Paris-Roubaix it feels like waiting for the performance to begin. Those are the moments that compel me in sports photography, much more than the typical height-of-the-action shot would. 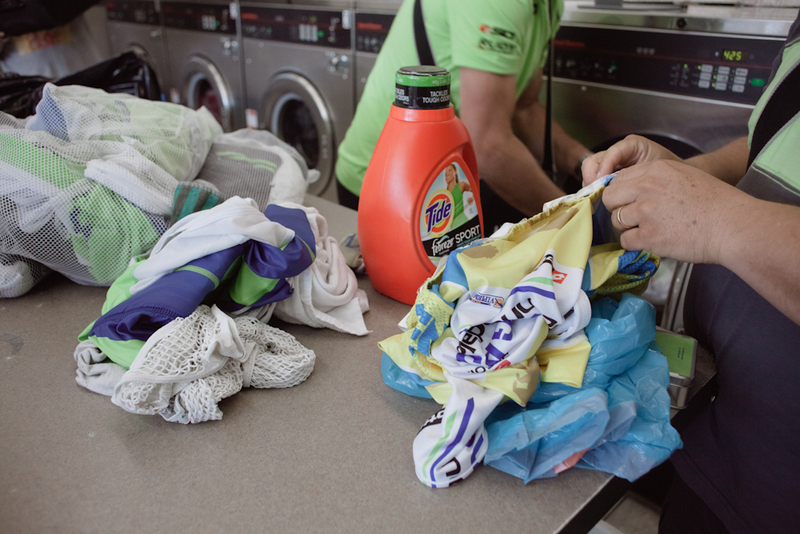 Tour of California leader’s jersey at the laundromat. Photo courtesy of Emily Maye. You just started shooting cycling at the 2011 Tour of California. 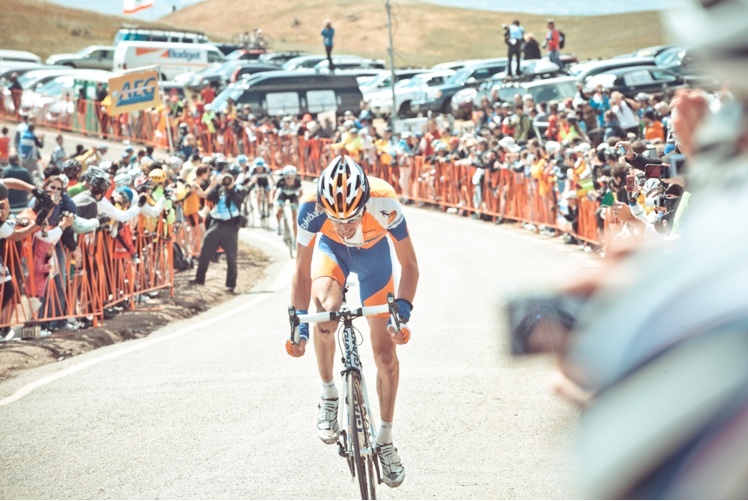 What made you want to document bike racing? 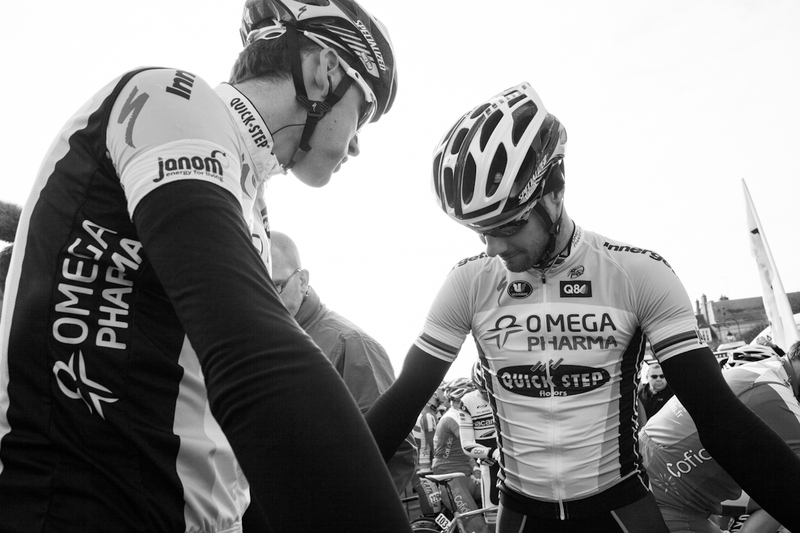 What about that experience inspired you to try and build a career as a cycling photographer? I wanted to photograph how I felt about it. To draw out the tone of what I saw in a tremendously beautiful and complex sport. I had an idea in my mind of how I would want to document it and it’s been a struggle to execute that in the way that I ideally would like to. I wanted to photography the moments that I couldn’t see by watching the race on TV, I guess. I think that was the real impetus. I have a few days that really stand out where I feel like I’ve gotten to do that. Some days you feel like its a real struggle to take a picture you haven’t already taken and then other days the you connect with the story and it’s a real joy to be witnessing something through the lens. After the 2011 Tour of California I just wanted someone to look at my photos. I didn’t expect I would build a career out of it, though I wanted to. My experience at the Spring Classics had a profound impact on my commitment to it. How did you get from shooting those four stages in California to working for some of the biggest brands in cycling and getting published in a half dozen or so cycling magazines? I think cycling might be the most over documented sport in the world, honestly. So the competition is pretty strong. I didn’t really know that when I started. Social media has been the biggest help in people seeing my photographs. I didn’t know where to begin to build contacts for getting published. There are still a lot of people I would love to work with that I’m not sure how to make contacts with. Rapha was one of the first to praise the Tour of California photos and Bicycling was the first publication that saw my work and put it in print. Since then I’ve gotten to work with some really cool brands and have quite a bit coming out in print these next few months. I am very excited to see the multi-page spreads in Soigneur, The Ride Journal and the Peloton Photo Annual that will be coming out. Paris-Roubaix. Photo courtesy of Emily Maye. You’ve had the chance to shoot many races in the U.S. and Europe at this point. Which trips have you most enjoyed, either for the subjects you were photographing and the places you were in? Since I have only been doing it for such a short time, each experience has been pretty special. 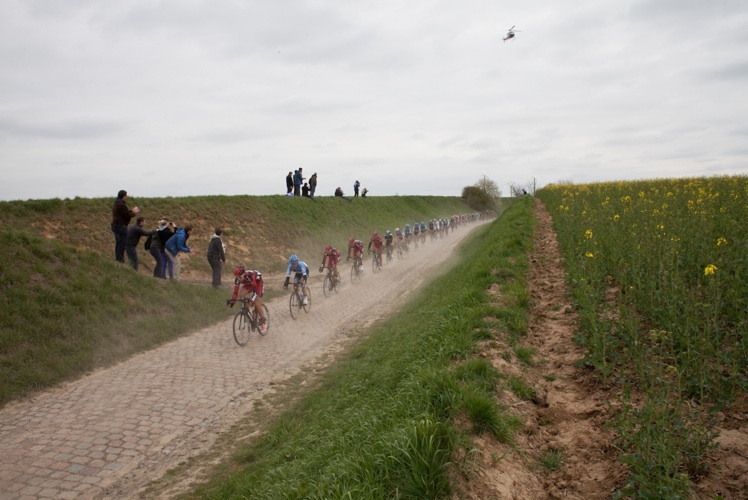 But there is no comparison for what it was like to be at Flanders and Roubaix for the first time. The energy of those races and their importance to the riders and the fans really elevates the experience. For me the race isn’t the thing, it’s all the other stuff, so I have to be there for those moments that I want to capture. Like Robbie McEwan waiting for his last press conference at Tour of California or Tejay van Garderen’s Time Trial win at Utah on his birthday. Those moments are really special. I will never forget missing the velodrome on my first Roubaix and getting stuck on the cobbles in the car with fans leaving while riders were still trying to finish the race. You don’t see that on TV. Any of those guys could’ve stopped at that point. They are literally avoiding fans while trying to get to the velodrome because finishing the race matters. I was very touched by that. Tour of California. Photo courtesy of Emily Maye. What are your photography goals moving forward? Are there certain races you want to shoot? Magazines or clients you’d like to work for? I am really excited about photographing cyclocross. I sort of feel the same way about cross as when I first set off to shoot road cycling, so I look forward to seeing how that experience plays out. I will be in Bend in December, Belgium over Christmas and New Years, and Louisville for Worlds. I want to keep pushing myself to make interesting photographs that capture that tone of what this sport means to me. Of the races I haven’t been to yet, the Giro is the one I’d most like to do and I am excited to do the Spring Classics again. But a book is the ultimate goal. I am also interested in conversations with people in cycling, I enjoy talking to people about the sport and I would like to add some words to the photographs. 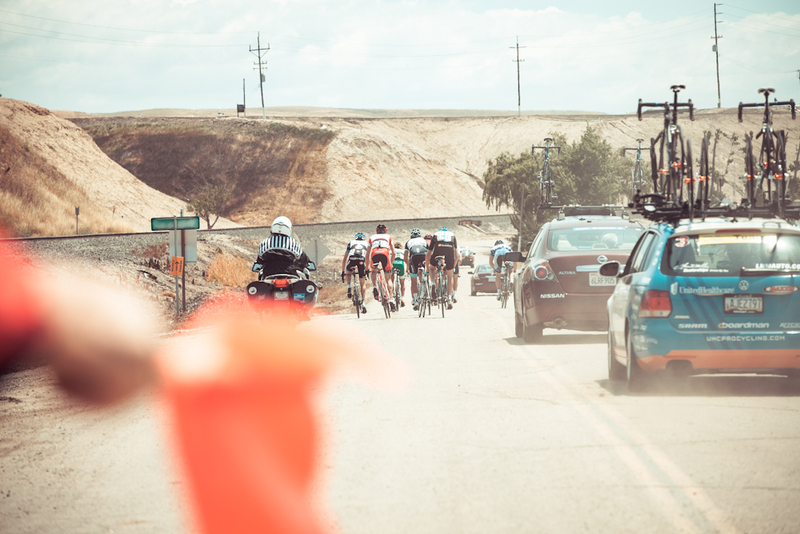 This entry was posted in Art, Interviews, Racing and tagged bike race photography, cycling photography, emily maye photography, paris roubaix, tom boonen, tour of california. Bookmark the permalink. Always really interested and pleased to discover others finding common ground between cycling, dance, and music. Nice to have come across your site – much to read & enjoy over a snowy weekend here in London!